This is very similar Dean’s old Blue Comfy Jacket from the early seasons. The thing that separates it from the early season’s jacket is the fact that the breast pocket flaps are square, rather than pointed. It is the blue version of Dean's Dark Jacket. In The Things We Left Behind (10x09), Dean wears this jacket from when he and Sam meet up with Cas until the end of the episode. In The Things They Carried (10x15), Dean wears this jacket when he and Sam drop Cole of at his friend’s house and then proceed to follow him to the cabin. He takes it off briefly, when he and Cole turn the cabin into a sweat lodge, but then wears it again once Cole is all better and it’s time to say goodbye to him. In The Werther Project (10x19), Dean wears this coat when he slaughters all the vampires at the beginning of the episode. It gets quite blood-stained. In Into the Mystic (11x11), Dean wears this coat to salt and burn a corpse, and then again when he and Sam are guarding Mildred and waiting for the banshee to strike. In All in the Family (11x21), Dean wears this jacket when he and Sam go to meet Metatron, and then again when he speaks to Chuck in the park, and then again when he goes to meet Amara, and when he and Sam drop Donatello off at a waiting taxi to take him home. In Alpha and Omega (11x23), Dean continues to wear this coat every time he is not inside the Bunker, except for the beginning of the episode when they have just returned from the battle with Amara and Dean is decides to drink in the kitchen. In Keep Calm and Carry On (12x01), Dean wears this jacket for the entire episode, briefly giving it to Mary while they talk in the park, and after that only taking it off as he and Castiel work to conceal the body of the woman that Mary kills in defense of her son. In LOTUS (12x08), Dean is wearing this coat when he gets home with the take-out, when they get back from investigating the Cardinal, and then he wears it again when they leave the Bunker to go try to defeat Lucifer. He wears it for the rest of the episode. In First Blood (12x09), Dean is still wearing this coat when he and Sam are arrested and taken to the top-secret prison base. He is then put into a jumpsuit. In There’s Something about Mary (12x21), Dean wears this coat at the beginning of the episode when he and Sam are searching Mary’s motel room, when they go to the post office, and finally when they successfully capture Toni and bring her back to the bunker. 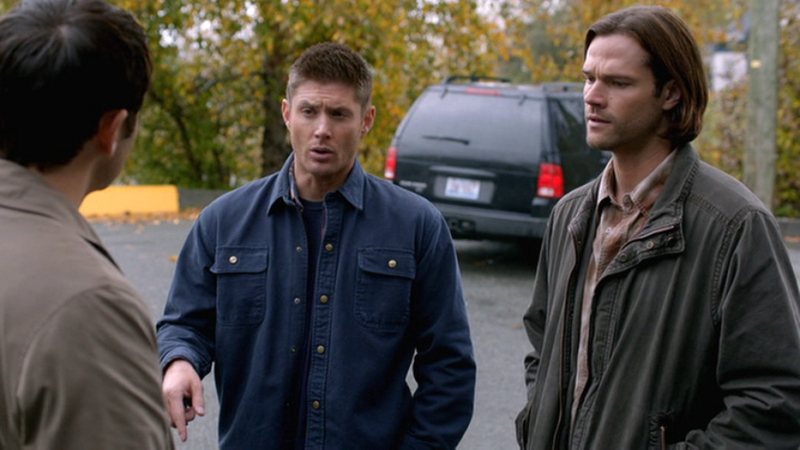 In Who We Are (12x22), Dean wears this coat whenever he is outside, or just coming in from outside. FATE: When Sam and Dean are arrested in First Blood (12x09), their clothes, including this jacket, are confiscated. When they escape, they escape only in their prison jumpsuits and do not recover their clothing... ONLY SOMEHOW THEY DO! Because Dean miraculously has this coat again in 12x22. So, the BMoL must have done him a favour and recovered it when they murdered all witnesses. One of my favorite jackets. I didn't realize this was a different one from the earlier seasons. I'm watching the early seasons right now, I'll have to pay attention to the pocket. I wonder if we've seen that jacket since. Is old one is also lined in red - I don't think this one is. Not that you could really tell in the old episodes, but you'd occasionally get a glimpse. In season 11 (I don't remember which episode) Dean Winchester wears his Wind River Green Jacket for a bit in the beginning of the show & maybe he wore it at the end of the show. Re: Wind River Green Jacket! IF YOU ARE INTERESTED IN SAM AND/OR DEAN WINCHESTER SHIRTS OR JACKETS PLEASE CONTACT ME!!! Please contact me at tylertroost@gmail.com. I have a lot of Dean & Sam Winchester shirts & jackets. I have all types in Sam & Dean Winchester clothing in all different sizes.